CANlog 3 and CANlog 4 record the data communication of CAN and LIN systems. They receive and save messages and then analyze them according to the specified configuration. These loggers are compact companions in vehicles for small test tasks. They are easy to operate and log up to 64 MB. In addition, they can be used particularly for gateway applications. CANlog 3 and CANlog 4 each support up to four CAN channels. CANlog 4 additionally has a CAN channel that can be used as a measurement channel. The loggers record in parallel analog and digital input signals. With CANlog 3 the data are saved in internal memory (max. 64 MB), and with CANlog 4 on exchangeable flash cards (max. 64 MB). Events can be displayed depending on the configuration via the digital outputs and LEDs. The configuration program included with the product allows you to create a configuration customized for different applications. 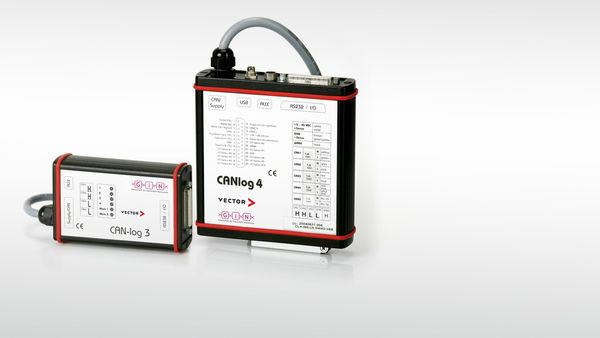 Additionally there are functions for using CANlog as a data logger, classing device and as a gateway. For more flexibility, you can extend both CANlog devices with digital inputs and outputs, analog inputs, or a LIN interface with I/O boards. With the GPS receiver CANgps you easily record synchronously in addition the position of your vehicle to the logging data. LOGview offers you the possibility of graphically representing data and displaying information during logging. Graphic functions: drawing of lines, rectangles etc. For the recording of additional LIN channels the external LINprobe adapters are available. In addition, you can send also LIN frames. The CCP/XCP license permits you to readout measurement data in DAQ mode directly from the ECUs and to record them. The license includes CCP and XCP on CAN.